This past weekend, I flew to Texas to celebrate my nephew's first birthday! 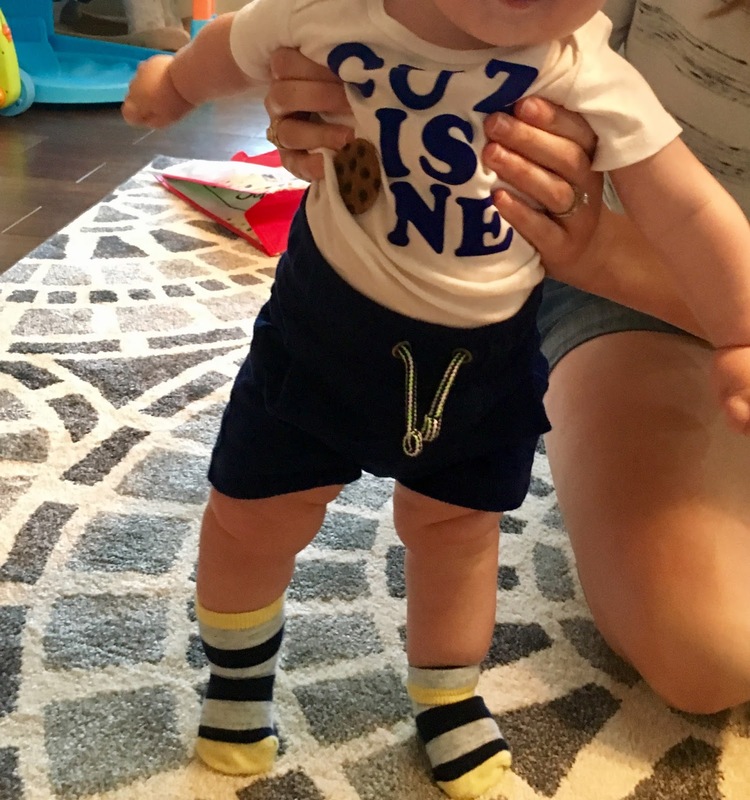 My twin's son is as close to mine without actually being mine as it gets, so it was an extra special, nostalgic weekend knowing this baby boy is already one! I mean, didn't I just post this picture for the first time yesterday? I helped Danielle plan the first birthday party, and we had so much fun making her vision a reality! 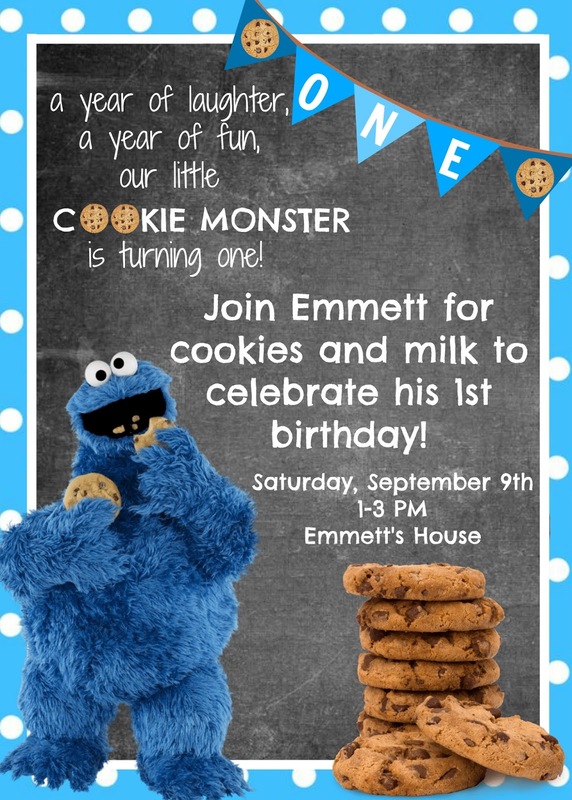 Baby Emmett has been an eater from day one, so we thought a cookie monster theme was only fitting. 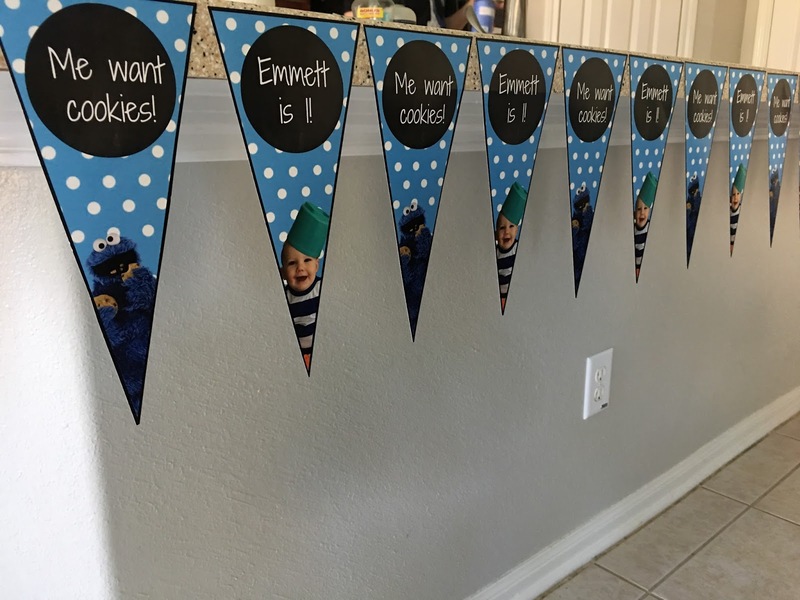 I want to share a few of the decorations and details we included for the party! I made a lot of the decorations on picmonkey.com and then had them printed at the local UPS Store for cheap. I like to think of it as Etsy on a budget! Here is the invitation I made for her to mail out. I don't know how to use photoshop or any of the fancy design websites, so thank goodness for picmonkey on this one! 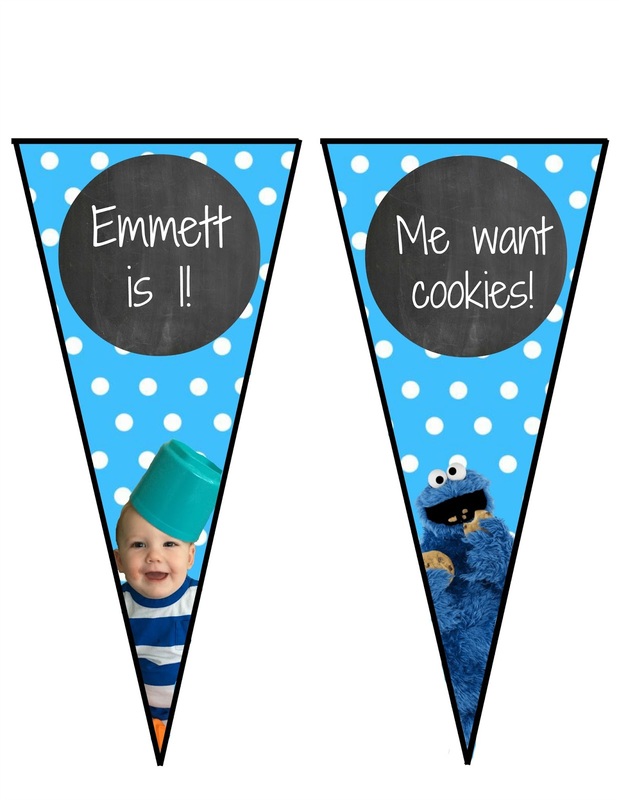 We wanted a pennant banner to go around the gift and food tables, so I created the two pennants below to alternate. I loved how these came out! Here they are hung up over the kitchen island. This was our favorite decoration (and also the most time consuming to make)! 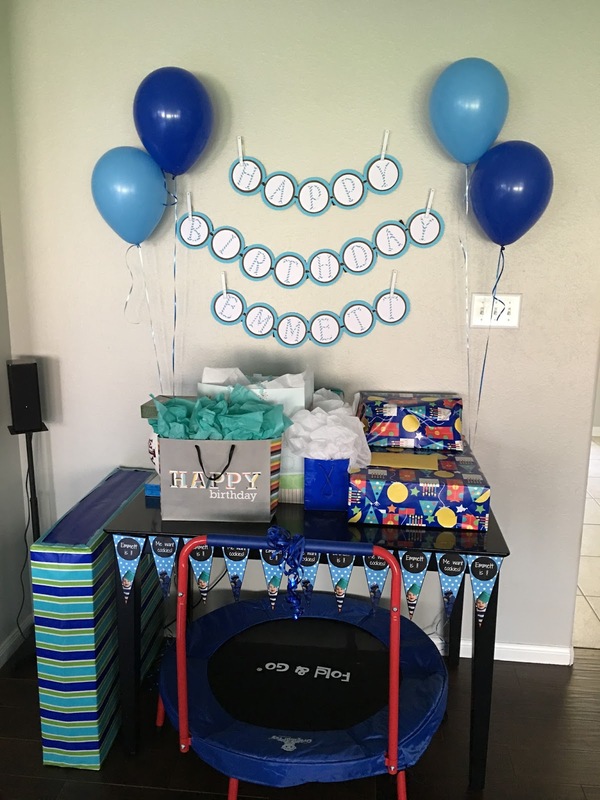 I used scrapbook paper and cardstock to make the circular banner hanging over the gift table. A little PSA for mamas: that baby trampoline was the hit of the party. All one year olds need a little baby trampoline, apparently! 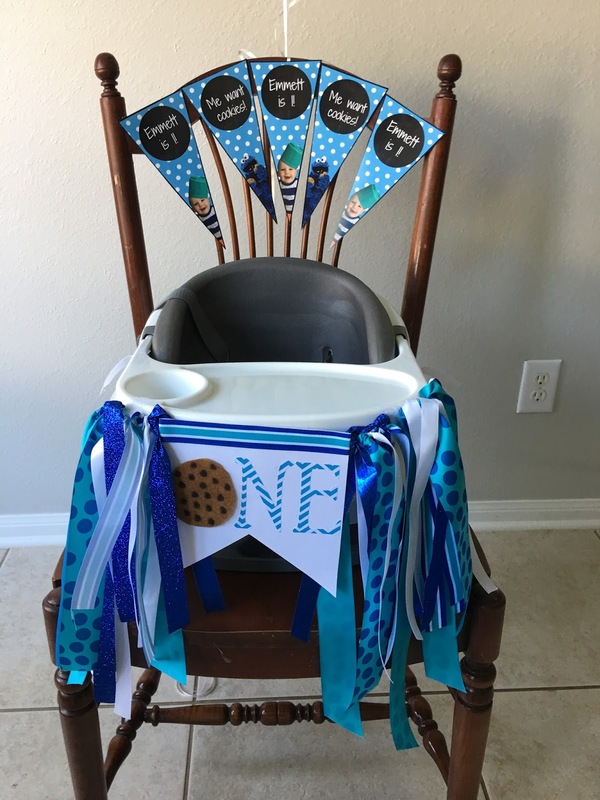 Here is the little banner I made for his high chair to use while he ate his smash cake. It was immediately thrown into the trash because it was covered in frosting, but it served its purpose! Here is the month by month progression my sister did. 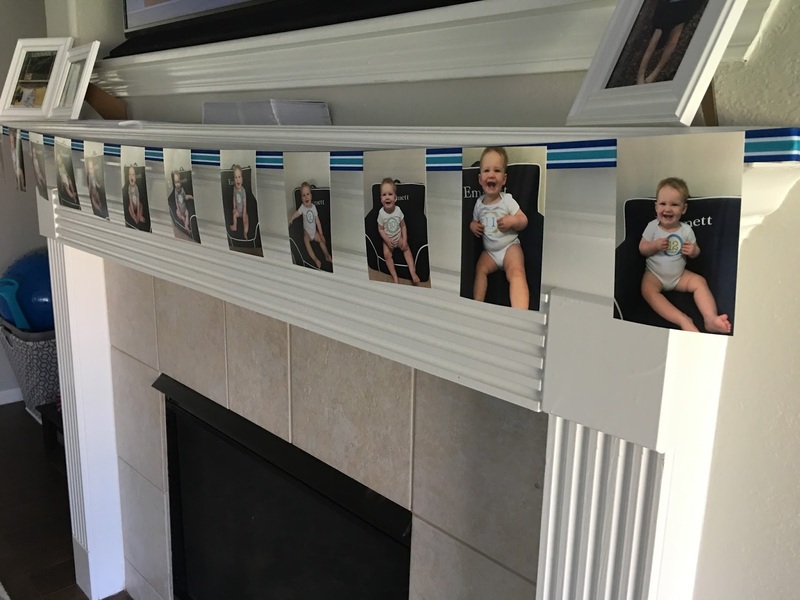 This was so fun for guests to look at and see how much our sweet Emmett has grown in the last year. I made this print (also on picmonkey) to display on the food table. That quote kills me! A fun thing my sister did that I want to do for Preston's first birthday too is this: she gave every guest a piece of paper and an envelope and asked them to write a letter to Emmett and mail them to her. She is going to keep them sealed and give them to Emmett when he turns 18. How special is that?! Here is the template I created and printed out for guests to write their letters. And last but not least, here is the birthday boy "sharing" his paci with his cousin. Preston was most definitely not impressed. I'm sure it won't be the last time they annoy each other! It was such a special weekend celebrating someone I love more than just about anything. 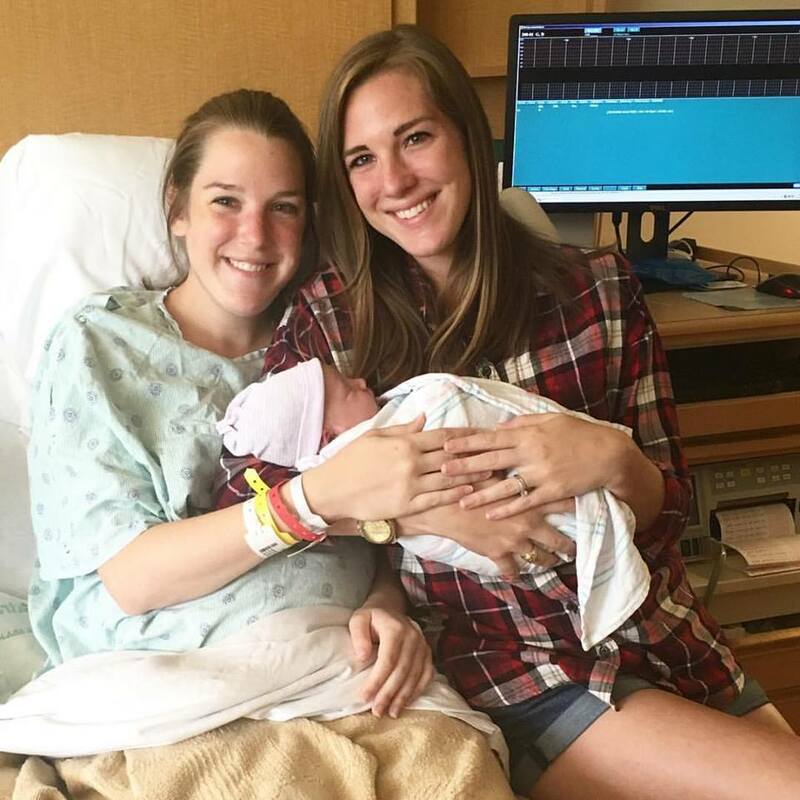 How this baby is already one is beyond me, and it just reminds me how quickly I'll blink and be celebrating Preston's first birthday. So grateful for these boy cousins! What a sweet birthday party!!!! 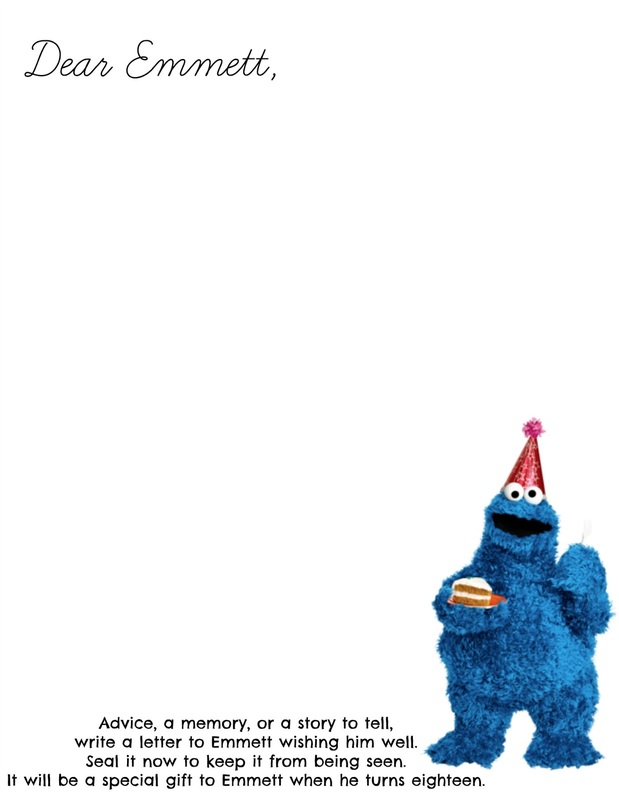 :) I love the cookie monster theme. 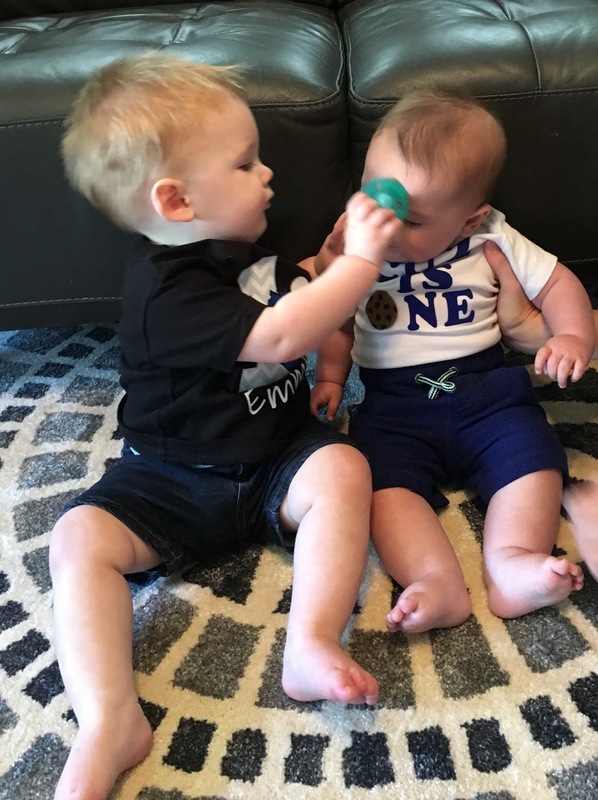 Preston and Emmett will be BFF's for sure! 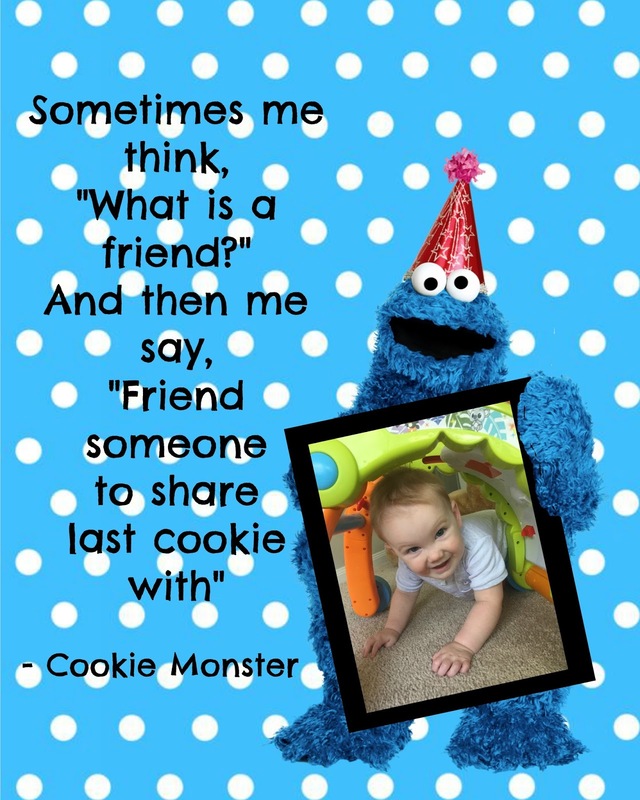 That Cookie Monster theme is the best! Y'all did a great job! This was an adorable party.